Le groupe qui accompagne le chanteur est conforme aux musiciens qui accompagnaient Hank Williams. Joe Matheson will be accompanied by a five-man band that's a replica of Hank's Drifting Cowboys: guitar, bass, fiddle, steel guitar, and drums. 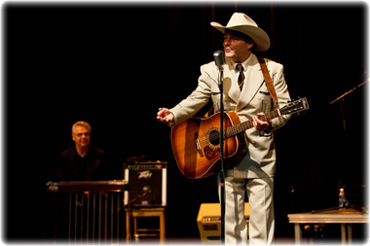 “The stellar performance of Joe Matheson – filled with wit, charm, and personality [and] his amazingly rich voice and emotional range...an amazing performance (that) transports you to a front row seat of the 1950s concerts of Hank Williams." "I closed my eyes and listened to Joe Matheson's voice - it truly was Hank Williams LIVE! Quite amazing, really!" "This was an awesome show. People are still talking about it weeks later." "The best show we ever presented." "Our first sell-out - EVER!" "I've been here five years and I've never heard a crowd like that. It was amazing."